The dirty secret of last season is that the Wolves were actually a decent defensive team when their starters were on the court. But their reserves were another story. 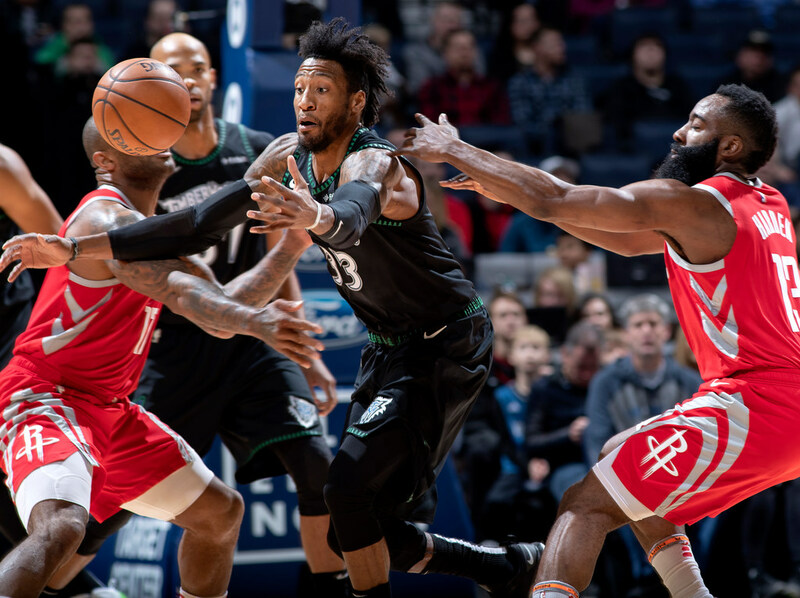 *The Timberwolves looked flat for a half against the Rockets on Monday, trailing last year’s best regular-season team 62-48 at the break (a margin that improved when Andrew Wiggins banked in a long three at the buzzer). The made part of their charge in the third quarter by using what might be their best offensive lineup, which pairs Dario Saric and Karl-Anthony Towns on the court together. Their combination of spacing, rebounding, toughness, post-ups and three-point shooting is a hard cover for any team — and particularly the Rockets, who aren’t nearly as deep as they were last year and lack size beyond Clint Capela. Saric and Towns combined for 10 points in the final 2:14 of the third quarter (three three-pointers and a free throw) to give Minnesota an 86-82 lead at Target Center. But it was perhaps the Wolves’ best defensive lineup that fully took control of the game: the grouping of defensive stalwart Robert Covington with four active reserves — Tyus Jones, Gorgui Dieng, Derrick Rose and Saric. That group held the Rockets scoreless for the first three minutes of the fourth. Towns re-entered for Dieng to give the Wolves a little more offense, but they kept the shutout going for a full 5:17 of the fourth quarter. By then, the Wolves had a double-digit lead that didn’t shrink below 9 for the rest of the game. The Rockets, one of the best offensive teams in the NBA, finished with just nine points in the entire quarter, 29 in the half and 91 in the game. In that fourth quarter shutout stretch, Jones had three steals. Covington’s quick hands forced two jump balls, both of which he won. When that group of Covington and four reserves is on the floor together — they’ve played 70 minutes as a group since the trade — the Wolves are outscoring opponents by 28.6 points per 100 possessions. Substitute Towns for Dieng, and the Wolves are outscoring opponents by 36.8 points per 100 possessions (albeit in an even smaller sample of 22 minutes). Tom Thibodeau talked at length postgame about how the Jimmy Butler trade that brought in Covington and Saric has made the Wolves deeper and given them better fits. The dirty secret of last season is that the Wolves were actually a decent defensive team when their starters were on the court. But their reserves had the worst defensive efficiency in the NBA. They started down the same path this season, but in their last 10 games their bench is No. 8 in the NBA in that category. It’s been pretty much forever since the Wolves had a second unit that could hold leads — let alone grow them. This is much as anything is a reason to think the Wolves might have something sustainable going. *Former Timberwolves guard J.R. Rider was at Monday’s Wolves game and had a pleasant interview with Fox Sports North’s Marney Gellner on TV. In a group setting with reporters, though, Rider wasn’t quite as eager to talk about his current role as a mentor. *In case you missed it, former Wild GM Chuck Fletcher wasn’t out of work for long. He was hired in the same role with the Flyers. Philadelphia has made the playoffs three of the last five seasons but lost in the first round each time. This year, the Flyers sputtered out of the gate and are under .500. *Speaking of being out of work, the Bulls fired former Wolves player and executive Fred Hoiberg after a 5-19 start. Minnesota fans are already clamoring for The Mayor to coach here, but the problem is they’re divided between whether he should lead the Wolves are Gophers. Both teams, of course, already have coaches. NHL in Seattle ... then NBA ... then Wolves to the Eastern Conference?